At Victory Ford, many of our Kansas City customers are looking for vehicles that are dependable, stylish, and comfortable. 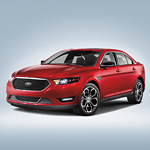 When people come to us with questions about which sedan might be best for them, we often point them in the direction of the Ford Taurus. The Taurus has been a solid performer for many years, and it's come a long way since its beginnings. It's evolved into a stylish, sleek vehicle that has strong lines and an aerodynamic shape. Adding to that feel is the front design. Narrow headlamps surround a wide grille; on the SHO trim, the grille consists of black mesh surrounded by a chrome exterior. When looking at the back of the car, the eye naturally is drawn towards the dual chrome exhaust tips. Designed with form and function in mind, they're nice accents on the tail end of the Taurus, as are the full LED lights.